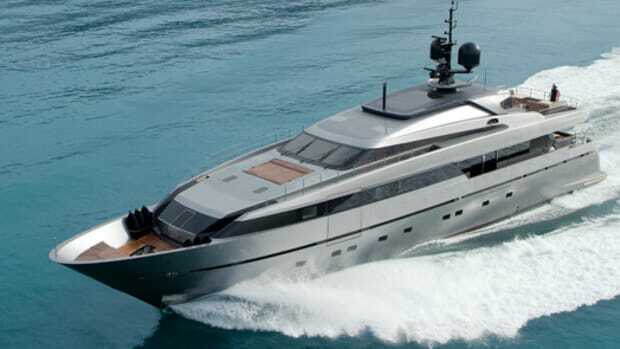 To address the speed issue, Stolk Marimecs gave the yacht a round-bilge, semidisplacement hull form, and Moonen decided to construct the entire yacht out of Sealium alloy. Although it may be unfamiliar to some in the yacht world, Sealium is commonly used in military and commercial shipbuilding applications, both for hulls and superstructures, in vessels such as patrol craft, work boats, and fast ferries. It&apos;s an aluminum alloy engineered for weight savings without sacrificing strength. In fact, it&apos;s said to yield 15-percent stronger welds than traditional marine aluminum. It&apos;s also engineered for higher corrosion resistance. Shifting the dining area over to starboard instead of situating it on centerline from port to starboard really opens up the flow of the yacht&apos;s main deck. 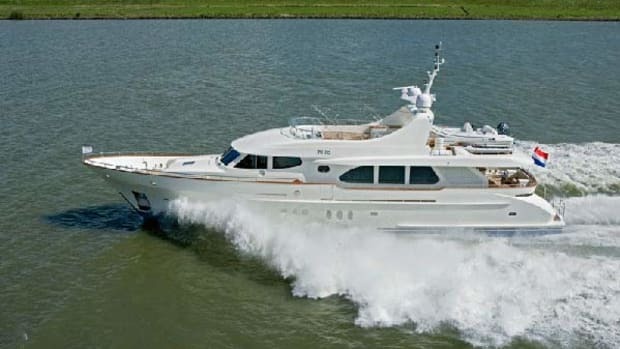 Also to address speed, Moonen put together a propulsion package quite unlike what most yachts in this size range feature. The first step was selecting Caterpillar C32 ACERT powerplants. Based on Cat&apos;s 3412, which is popular with builders and owners of semidisplacement megayachts, the 1,800-hp C32 ACERT delivers more power than either the 3412E or even C32 Tier 1 engine, according to Caterpillar, yet it&apos;s similar in size and weight due to its V-block. Moonen additionally selected Servogear controllable-pitch propellers—a first for its yachts—to optimize speed and fuel efficiency for Nilo (the second 94 Alu features fixed props). Servogear, a Norwegian-based company specializing in solutions for high-speed recreational and commercial vessels, also designed the thrust line, including propeller tunnels and rudders (though Moonen declines describing them further). 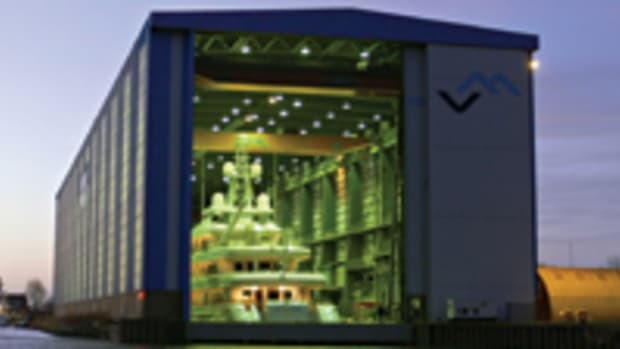 Emile Bilterijst, Moonen&apos;s managing director and a naval architect, had prior experience with high-speed vessels, so he&apos;d hoped the yard would one day do business with an owner who&apos;d agree to having this type of propeller system installed. All told, this setup reportedly permitted Nilo to flirt with 27 knots at ten-percent ship&apos;s load during sea trials and to squeak out 1 knot more than her 25-knot contracted top speed at 50-percent load. 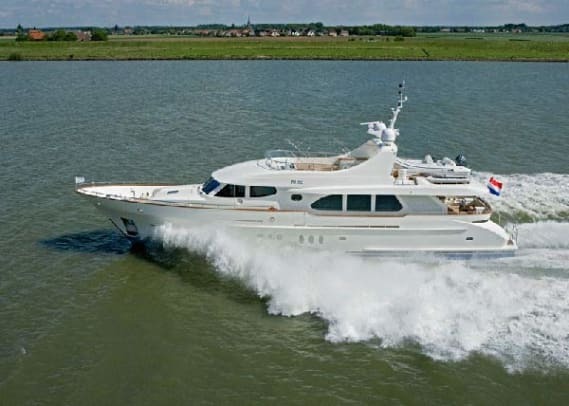 She also went from 0 to 20 knots in 20 seconds and 0 to full speed in 40 seconds, according to Moonen. Nilo&apos;s owner was certainly pleased. Having previously owned a handful of planing boats, most recently a Ferretti 68, he was accustomed to a good turn of speed. 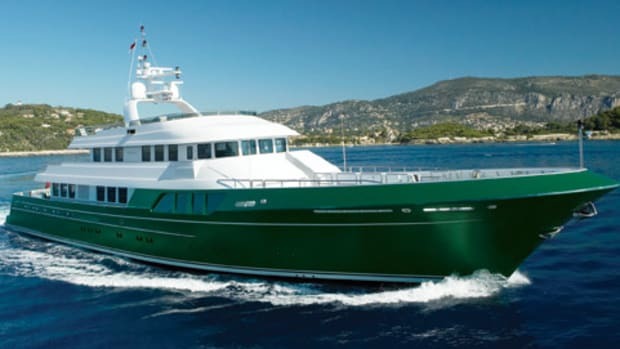 Since he wanted to extend his cruising range around and even beyond the Med, Moonen&apos;s own goal of creating an efficient yacht came into play, too. 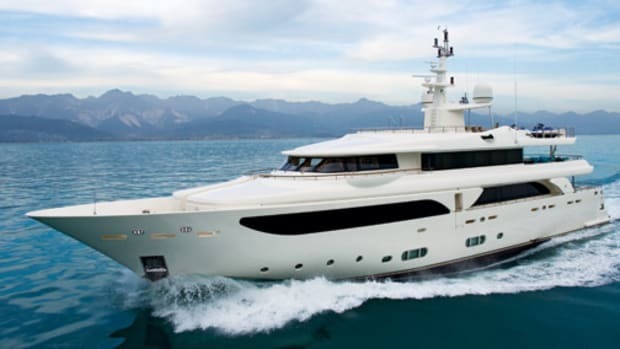 According to the yard, even with gensets running, the yacht consumes only about 18.5 gallons per hour cruising at 11 knots, yielding a 2,500-nautical-mile range. Whether the owner pursues this range with a large group of guests or just a handful of friends and family, the layout of Nilo serves the purpose well. Her main-deck floorplan is similar to that of most yachts in this size, meaning you can see straight to the helm from the saloon. But there&apos;s a difference. 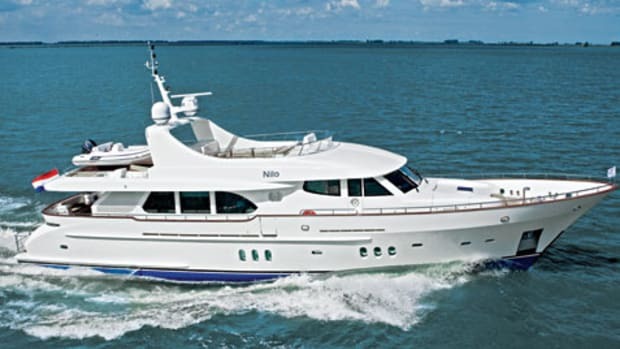 Instead of the dining area being nearly full-beam on centerline, Nilo&apos;s is tucked to starboard and runs fore and aft. There&apos;s also a pocket door that can close off the helm from the rest of the deck, if guests are watching a movie in the saloon or are otherwise engaged in a way that will disturb the crew at the helm. Another pocket door, this one aft to port at the helm, yields access to the galley, which the owner requested be tucked to this side of the yacht. The door allows both the chef and captain to enjoy some privacy while they work yet also makes it easier for a stew to take drinks and snacks out to the captain. Owners of all sizes of megayachts want full-beam staterooms these days, and aboard Nilo the master is amidships on the lower deck. 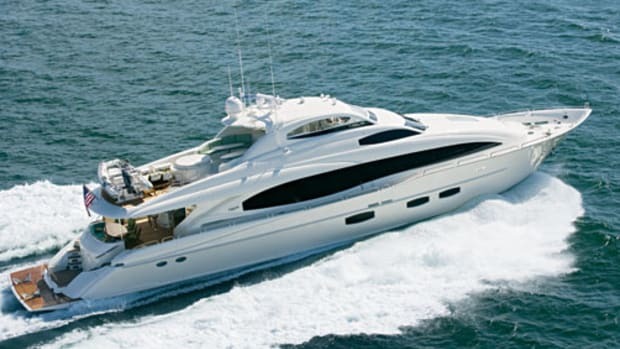 The VIP and two twin-berth staterooms, each with en suite head, round out the accommodations, and the use of light-tone anigre wood down here as well as above keeps the areas feeling light and airy. Moonen feels confident about the future of its new semidisplacement series, so much so that it now also offers a 99 Alu, one of which is already under contract. Yet it&apos;s wisely not abandoning the other "pocket-size" vessels that helped it make its mark. Two 97 Displacement Series yachts should splash this year, for example, and more 84s are on order, too. Construction is also well underway on an addition to the Displacement Series. 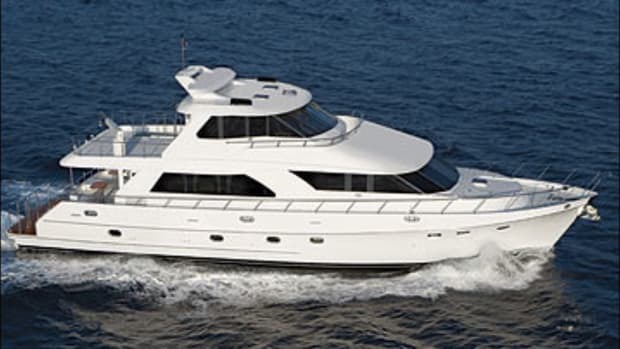 Based on the 120, which Moonen introduced just a few years ago, the 124 features a central atrium with a spiral staircase connecting the flying bridge and all three interior decks. 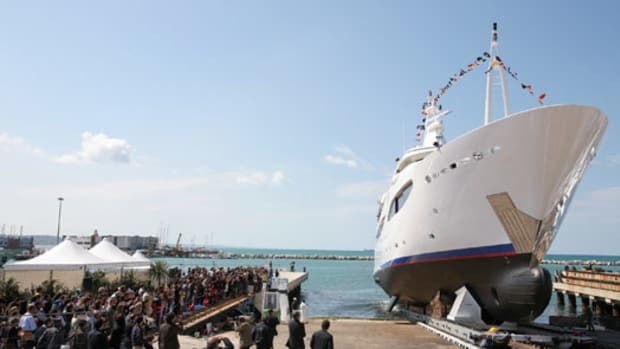 She&apos;ll be its largest-ever launch when she hits the water next year. Which suits Moonen just fine.